Why Do Some Protestants Use Grape-Juice Instead of Wine? Topic: Why Do Some Protestants Use Grape-Juice Instead of Wine? Re: Why Do Some Protestants Use Grape-Juice Instead of Wine? I understand that a single sip of wine for a recovering alcoholic can send them right back into darkness. You might understand that sentence but a reality it ain't. Oh, I'm not sure about that one Orthonorm. I am not an alcoholic so how can I say for certain? There are those very close to me that are. I would have to lean toward one drink can most certainly trigger a relapse. Now, whether that is a biological or psychological thing I won't speculate, but in the end does that even matter. If they can't have a drink without risking relapse then they can't have a drink! I do know. You can test this out on your friends. Cook or bake something with alcohol. Let them eat it. See if they go on a bender from that "drop" they consumed. "Alcoholism" and "alcoholic" are basically a trademarks anymore of AA. What a single drink ain't going to do is make you psychological nor physically dependent nor ruin your life nor send you off on a bender. Now telling yourself this over and over and having others tell you it as well . . . it does offer a great reason not to stop once you decide to have that "one drink" (which you have already decided is going to be a lot more than one) not to stop. I'm about as bad a drunk as you're gonna find. A drop of wine ain't gonna do nothing, unless I've decided it will. There are no "triggers". None. This is nonsense. After you are relatively sober, drinking after that is a decision accompanied by a lot of gross motor movements over which you have nearly absolute control. You might be miserable. But you ain't gotta drink. Again, after a reasonable degree of sobriety does such behavior enter the locus of reasonable control. Anyway, back to the "topic" I guess. The Greek word oinos dates from at least as far back as Homer's time, is used throughout the OT and NT, and is retained in modern Greek as a prefix in words like oinologhos (wine scientist), oinopoleion (shop that sells wine), etc. Oinos has also found its way into other languages, such as the word enoteca (shop that sells wine). The meaning of oinos has not changed one iota over the millennia. It meant, and still means, wine, fermented grape juice, without question. There is no wiggle room on this, despite what some well-meaning but misguided protestants try to say. I wasn't sure if the Greek within the Septuagintz is as refined about the sorta wine being referred to as in the Hebrew. EDIT: There is no "wiggle room" in Hebrew either. It has been traditional for churches to use, not unfermented grape juice, but de-alcoholised wine (i.e. it was wine, but they got rid of the alcohol). In my experience, grape juice is a more recent idea. We use grape juice at our church and I go along with that because, although I think the early church used wine and that some of the symbolism is lost with grape juice, the scripture only specifies 'fruit of the vine'. I have been to a couple of Anglican churches when away on holiday, where a choice was offered. Anglicans go to the front for communion, and those with medical or conscientiouis reasons for wanting non-alcohol were directed to the appropriate line. I thought that was good. In that case I joined the main, real-wine line. I have had communion with elderberry wine, and though I know you good folk think our sacrament doesn't work anyway (no priests etc), can you think of any reason not to use elderberry, in a country where grapes do not grow but elder is abundant? It is a deep red, and an excellent accompaniment to a real meal, as the early communion services were. the scripture only specifies 'fruit of the vine'. Revisionism at its finest, which flies in the face of the profuse use of oinos in scripture. Communion without wine is like a church service without snakes. Shame to have the poor beasts work year round! It has been traditional for churches to use, not unfermented grape juice, but de-alcoholised wine (i.e. it was wine, but they got rid of the alcohol). A friend of mine has recently bought one. He won't repeat that mistake. I love how folks think in the 1st century they had a choice between "leaded" and "unleaded". Wine was wine. It was not de-alcoholized, it was not grape juice....it was wine. The early Christians were a little busy with dodging the authorities and sneaking into the catacombs for worship to worry about such puritianical nonsense. I can hear St. Ignatius of Antioch now, "We hold the medicine on immortality....but only if its O'doul's (non alcoholic beer for you non-americans)"
I like how 21st Century Folks think that 1st Century Folks just had "wine". Wine has never been just wine. The arrogance of modernity. If wine has never been just wine, then what has it been? You can test this out on your friends. Cook or bake something with alcohol. Let them eat it. See if they go on a bender from that "drop" they consumed. Cooking/baking burns off the alcohol. Unless you put a ton of it in that not everything burns off during the cooking process. This is any easy answer. Many Protestants do not condone the consumption of alcohol. the really really easy answer is that unfortunately there is a growing population of alcoholics and recovering alcoholics who can not drink wine at all. And, witnessing it myself, is a very sad thing which should not be mocked. "Clothe yourself with compassion, kindness, humility, gentleness, and understanding[/i]." The quantity of alcohol in a spoonful of the Holy Eucharist is minute. We give it to babies. Plus, if one believes in transubstantiation, it's not really wine any more. I am definitely on that page, however I have also endured being raised in a family where addiction was and is prevalent. The devil can, and will, use even just a sip of wine to throw an addict off the Divine Ascent toward God. The devil has no power whatsoever over the Blood of Christ. Partaking of it frequently is the surest way to keep the enemy away. Not on the Blood of Christ but on us. He can surely deceive us to take it as wine. You mean, it doesn't have the physical and chemical properties of wine any more? My priest has admitted to feeling light-headed on some occasions. Sometimes he overestimates the amount of wine needed. A "merrymaker" he is not . No, it isn't either/or. Still, I'm having a hard time even imagining that the Blood of Christ, in whatever guise, would cause anyone any harm. I know of several recovering alcoholics, staunch Catholics (including one celebrity, comedian Frank Skinner), who, far from avoiding Communion, make of it a weapon in their struggle. Even if one argues that RC sacraments are graceless, that attitude is telling. As choy mentioned earlier, if we stay away from the Eucharist out of fear of alcohol, the devil has won. 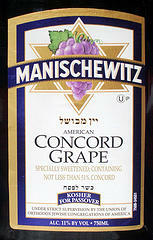 Do the Orthodox add water to the wine, like the Catholics do? That would certainly minimize some of the effects of the wine. The brief rite of pouring water into the wine used for consecration is very ancient. Indeed, it is believed that Our Lord himself used wine tempered with water at the Last Supper as this was the common practice among the Jews and in Mediterranean culture in general. Some form of this is found in practically every rite of the Church both Western and Eastern, except for a group of Armenian Monophysites. Although the water is not essential for the validity of the sacrament, the Church holds it in great importance and it must never be omitted. The Council of Trent even went so far as to excommunicate whoever denied the need for this mixture (see Canon 9, Session XXII). Yes. In memory of the 'blood and water' that came out of the spear wound. Perhaps I could add that my priest is diabetic - and he has never felt that he was necessarily affected by the alcohol. It could very well be that by the end of DL he is already feeling somewhat light-headed due to his condition, and has perhaps mistakenly attributed his lightheadedness to the alcohol rather than to the lack of proper nourishment for his body. Like you, I hold firmly that the Eucharist will not bring harm. I don't know how you can reconcile "The bread and wine might harm me" and "This is the Body and Blood of Christ". And it's not just fear of alcohol that keeps us away, but other fears as well that have been discussed elsewhere. Unfortunate. I don't know how you can reconcile "The bread and wine might harm me" and "This is the Body and Blood of Christ". Because it's not just the body and blood of Christ... it doesn't just appear to be bread and wine, but is in actual fact. Wrong. You have no idea what you are talking about. "The devil" can try whatever he wants, but it would take an act of God for a drop of alcohol to do whatever you think are describing. Then again, the devil only does what he does in virtue of God, so maybe you are right after all. No, I've decided your post has nearly zero semantic content. Granted the former tastes better than the latter, but hey, wine is never just wine. You actually think law enforcement believes that Communion wine is the Blood of Christ or even cares that we believe it is? No. Do they think it's alcohol, though? If yes, why not restrict it, or at least put it in a special category (a la peyote)? If not, our point stands against the nonalcoholists. If I risk having Social Services step in if I'm seen giving my 4-year-old a sip of my beer (I kid you not), what makes Communion wine different in the eyes of the law? Consumption of trace amounts of wine in the Eucharist is part of a religious ceremony, which I believe the law protects. Even if it was just bread and wine, the amount of alcohol they are receiving should be comparable, if not less, than the alcohol found in some medicines. Anyway, we've been doing this for 2000 years and we haven't killed babies yet. Also, how can Social Services be there to prove that this is taking place when they should be dismissed before the Anaphora (I know that doesn't happen anymore). My point exactly. You cannot reconcile the two. If you believe one, the other makes no sense. I guess I don't understand your point... what does sense or being able to reconcile things logically have to do with the eucharist? Have you lived with an addict? Do you know much about it? I have witnessed this first hand. Can you explain "but it would take an act of God for a drop of alcohol to do whatever you think are describing." Addicts are lightweights. And who isn't one anymore? Try living with an alcoholic. I do. Every day. Oh an the occasional alkie that stays with me as well. It takes a bit more than a tablespoon of wine to kick off the allergic reaction that brings the craving for more. I am a recovered alcoholic with 22 years in AA and I have never once seen someone come back in the doors of AA saying "man, that communion wine sure got me this time". Most people I know in AA participate as usual. Congratulations on your years, but remember even the not so bright folks who started AA knew that the allergy thing was a model to make more understandable the way an alcoholic reacted to alcohol to the even less bright people they were talking to. And thank you for saying recovered and not recovering. Actually you are getting my point - we really do agree. I think there's just some way in which we are talking past each other. Let me try again: If someone claims to believe that the Eucharist is the Body and Blood of Christ, the statement "The bread and wine might harm me" contradicts that claimed belief. To hold the two beliefs is contradictory and illogical. That being said, yes it is true that the belief that the the wine and bread are the Body and Blood of Christ is not something to be determined logically - so in that sense we still agree that logic and the Eucharist have little to do with each other. Um,.... nope. The disease concept predates AA by a long time. Check out Dr.Benjamin Rush. His research back in the late 1700's and early 1800's put forth that conclusion. It goes back much further than that, but he is the one that brought much of what we know about addiction together for the first time. Umm . . . the disease / allergy model was popular by AA (I didn't say they invented or discovered the allergy (really dumb) or disease (slightly less dumb) model of alcoholism) and then they became confused and took the model literally at least in many of the rooms I've been in. Alcoholism ain't a disease nor an allergy. We can get into how alcoholism is understood by AA elsewhere I guess, but it primarily a incredibly imprecise phenomenological judgement made by the one claiming to be alcoholic and those who would accept or reject that person's judgement. EDIT: To the bolded, really there is no discussion to be had. If someone confuses "addiction" with alcoholism then they likely know little about either nebulous concept in any meaningful or formal manner. EDIT: To the bolded, really there is no discussion to be had. Actually there is a discussion to be had, we are having it. If so, would you please take it somewhere else? Thank you. Page created in 0.203 seconds with 26 queries.